I recently bought a beautiful vintage 66 Es-335. However, I noticed that the ABR-1 may not be original when changing strings. It seems that it is wired, chrome (shiny surface), ABR-1 with brass saddles (yellow/gold spots). The back of ABR-1 is not convincing neither. what brand of ABR-1 is this ? 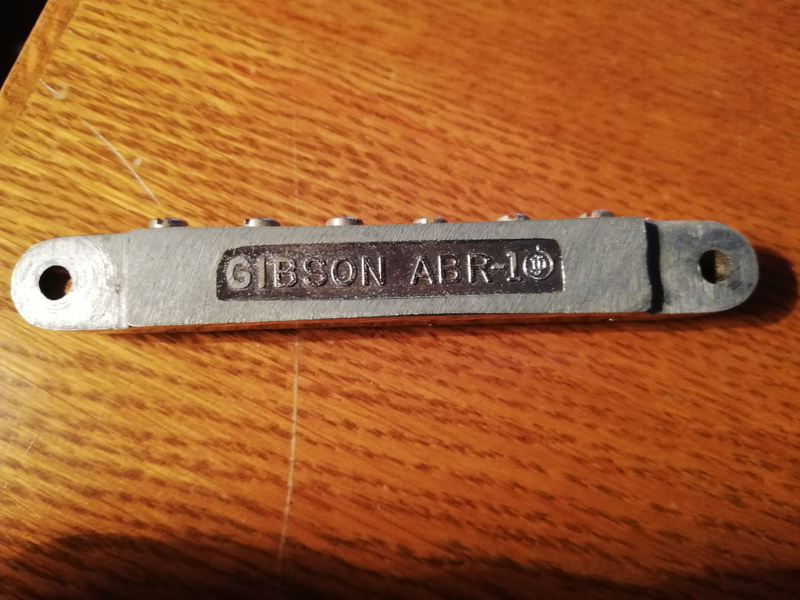 Or is it genuine gibson and im missing something ? +1 for me the saddles give it away. I'd love to try in on my own...speaking of which, I am due to get my TH58 back from a refret (with SM 154 size) and something like this would have sent it beyond the edge. I think the old hardware sounds different. Has the bottom been ground down to set it even lower? Yes underside has definitely been ground down. Neck angle / action I suppose. They went medieval on the bottom with the belt sander to lower it and filed down the height of the bass side saddles to lower them. They butchered the top of the bridge body with a file for clearance or out of stupidity. 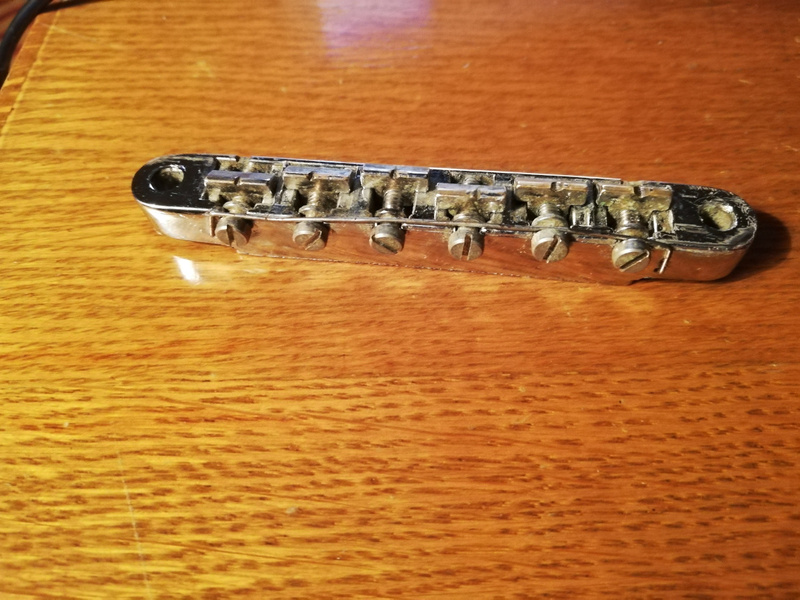 If it plays well, enjoy it and play the crap out of it, because if the neck angle is too shallow you'll have to play the same game to replace the bridge which is probably smiley'ed (deformed). Pigtail used to make a low profile ABR if/when it needs to be replaced. I will ask this to the original owner. 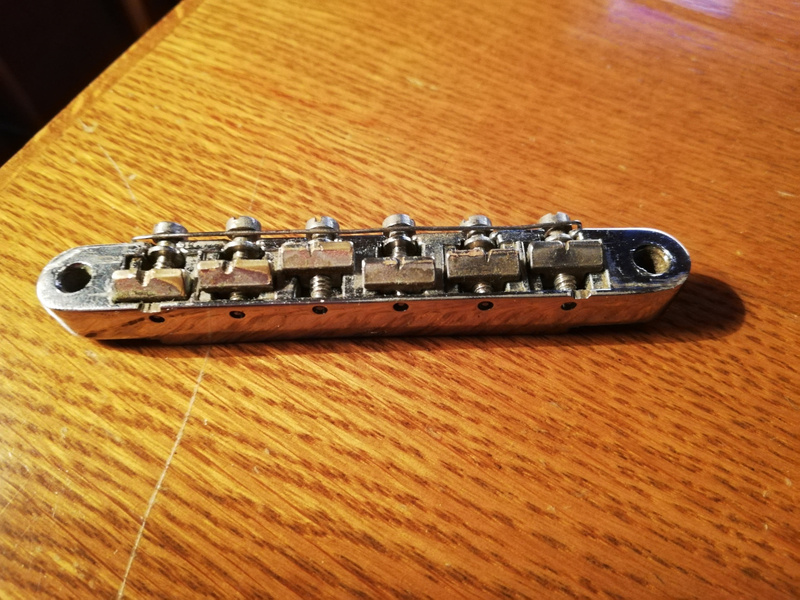 But you are most presumably right, cause when I get it, I saw that the saddle directions were in reverse direction and the low E string was buzzing due to saddle screw. (I re-changed the directions afterwards, now it plays very good) Maybe due to some problems, they really performed a sanding process like you said and changed the saddles from zinc to brass and the glitch near the foundry mark is gone. But why would anyone do such a thing is beyond me. I actually did a comparison with original 61 ABR-1. Even though the strings (.10 pure nickel) are almost dead, there is audible difference acoustically. Both bridges have sonical differences but they are both great. FWIW I replace saddles on my vintage ABRs when they’re worn. Makes the guitar more enjoyable to play, sounds better, and as long as I keep the old ones in a little bag in the case, no value is lost. Which brand of repro saddles do you prefer ? or do you get vintage saddles ? Is there any chance that you might have weighed those when you buy ? I wondered the iron impurity of the saddles. They sound good. That’s the only test I conducted. 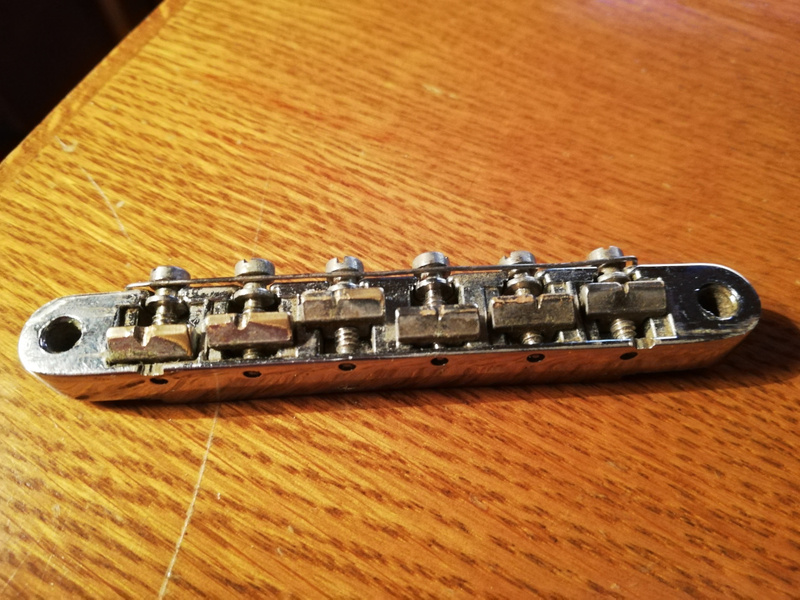 I'm currently watching this abr-1 on reverb and wanted to see if anyone felt it was legit, including the thumbwheels, saddles and screws. From the pictures I'm having a hard time telling if it is Nickel or Chrome. Also while the saddles are listed as NOS, the bevel seems too shallow for vintage. I've been looking for a no-wire abr-1 and any feedback would be really appreciated! You need new saddles and a new spring, put the saddles in the correct direction.